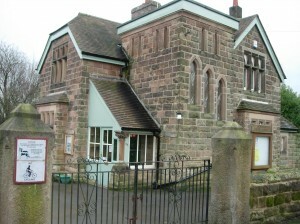 Located on Hazelwood Road, Duffield Cemetery was built in 1895 and is home to three beautiful Grade 2 listed buildings, The Chapel, The Lodge and The Committee Room. The Cemetery is open for burials and internments and has twelve burial blocks and a large formal garden of remembrance. There is a large area adjacent to the formal garden of remembrance where visitors can sit and reflect, taking in the view across to Turnditch and the whole of the Ecclesbourne Valley. There are also allotments located on the site. In the oldest part of the Cemetery, three of the blocks have been allowed to grow naturally, creating a nature reserve under the guidance of English Nature. Throughout the summer months Knapweed, Birdsfoot Trefoil, Great Burnet and Harebell wild flowers can be seen swaying in the wind, while Meadow Baron, Speckled wood and Small Blue butterflies can be seen flying throughout the area. The Cemetery is very important to all individual families and for this reason the Parish Council does not allocate plots to users in the cemetery, but encourages individuals and families to choose their final resting place within the cemetery blocks themselves. Families may pre-purchase their plots and as with plots purchased at time of burial an exclusive right is granted of up to 50 years for the plots chosen. The Cemetery Chapel can be used for small funerals and can accommodate up to 46 people. Charges for its use can be found in the document below. The Committee Room is used for Parish Meetings. More information about purchasing a plot in the Cemetery, costs, and Cemetery rules and regulations, can be found below. If you need more information, contact the Clerk. This document brings together a list of useful links including guides to funeral planning, website links to local funeral service directors and memorial masons, and memorial guidelines for Duffield Cemetery. Rules for what we allow on graves. Updated for clarification, April 2018. Memorials in open spaces (trees, benches or memorial plaques) policy. Find out more about the transfer of exclusive rights of a burial plot (TERB). This form covers various Parish Council funeral services including purchase of Exclusive Rights to a plot in the Cemetery, burial services and Garden of Remembrance plots. It replaces the Interment form from April 2019. Updated April 2019 to show memorial size specifications.